Availability: Available on Wii and a number of other platforms. It’s now officially three years for me here at Just Games Retro, which seems like a lot until you realize this site’s been chugging along for a decade and a half (!!!). Now, over the course of that time, it’s pretty much been JGR corporate policy that we generally don’t cover RPGs. It’s not that we explicitly dislike the genre and make a point to avoid them, but as J Man has stated in the past, they tend to be extremely time-consuming and our policy of finishing a game before reviewing it kinda clashes with that. Also, in my case, I inevitably get stuck to the point I need outside help to make progress, and that tends to dampen any enthusiasm I have to continue. It’s really kind of a shame, though, that we lock ourselves out of that entire genre, because there’s quite a lot of RPGs out there, and the Super NES itself has a laundry list of them. Out of all of them, however, it does seem like there’s a Big Four of sorts for SNES RPGs: Final Fantasy III, Super Mario RPG, Earthbound, and the game we’re covering for my three-year anniversary, Chrono Trigger, by Square Soft. 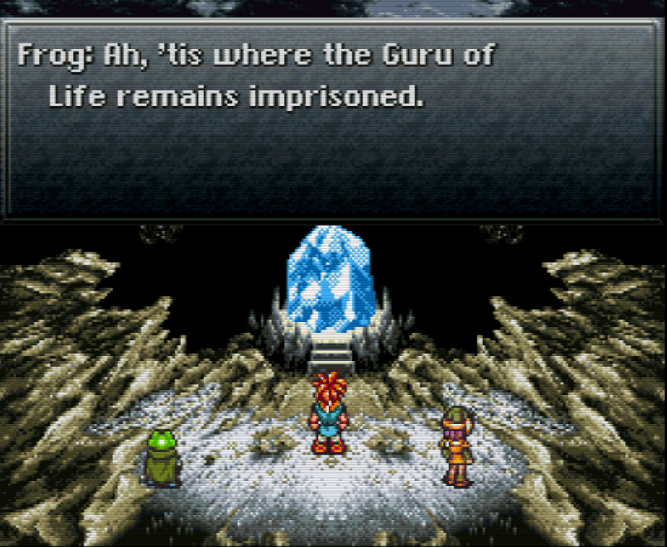 It starts out simply enough, you play as Crono, a boy who lives in the Kingdom of Guardia in the year 1000. The townspeople are having a fair to celebrate the millennium, and a chance accident, where Crono bumps into a girl named Marle while on his way to watch a demonstration of a teleportation device, leads to Marle’s disappearance into a freshly opened rift in the space-time continuum. Now, as clichéd a setup as that sounds for a Japanese RPG, and even if you’re not familiar with RPGs, it still probably sounds like a hackneyed time-travel plot, let me tell you, this game tells its story magnificently. In your travels, you will bounce around from the game’s present, to the Middle Ages, to prehistoric times, to a bleak and snowy future, even to the literal End of Time itself, all in search of a way to stop Lavos, an evil deity that corrupts anything it touches and eventually brings about the apocalypse in 1999. 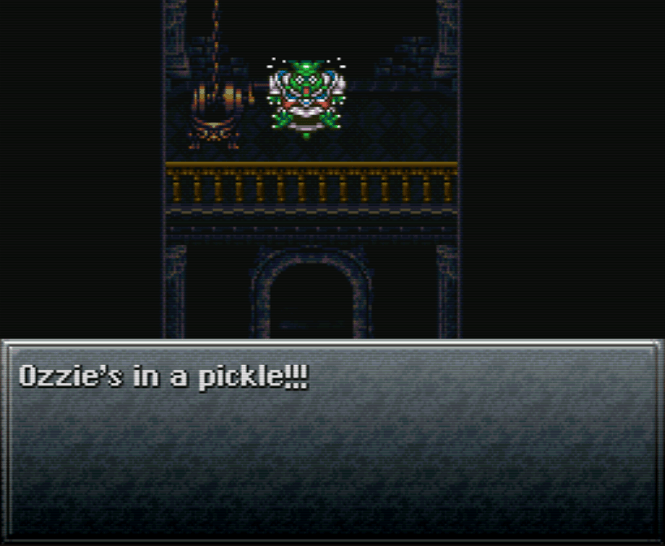 Again, pretty stock stuff, but where Chrono Trigger’s story truly shines is its ability to weave so many intricate subplots in and out of the main story. You’ll happen upon the magical Kingdom of Zeal, and how its arrogance and irresponsibility in 12,000 B.C. begat the schism between mystics and humans in 600 A.D. You’ll see how intervening in the war between mystics and humans in 600 might have been a waste of a prime opportunity to defeat Lavos. You’ll even see humans and dinosaurs existing in the same time frame, and that’s just cool at any point. It really tells the “what you do in the past affects the future” story expertly, and every swerve, every twist, every big reveal comes at just the right time, and does so with a subtlety that both tells the tale and causes you to feel like you know exactly as much as the characters do, instead of feeling like you’re fifty pages ahead and you’re waiting for your dense characters to catch up to you. Speaking of your characters, while they very much play to the tropes of many RPGs, everyone’s part in the parade is done so well that they’ll seem like fresh, original concepts. 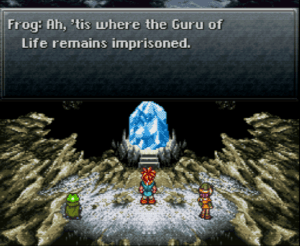 Crono is your basic adolescent Japanese teenager with bad hair who rarely speaks. Frog is the standard samurai type who puts honor and duty above all, although for the record, I thoroughly enjoyed his medieval “thou must prepareth to die” dialogue gimmick. Robo is your usual “machine that develops humanity” teammate, and Marle fits the “spoiled girl looking for thrills” slot nicely. 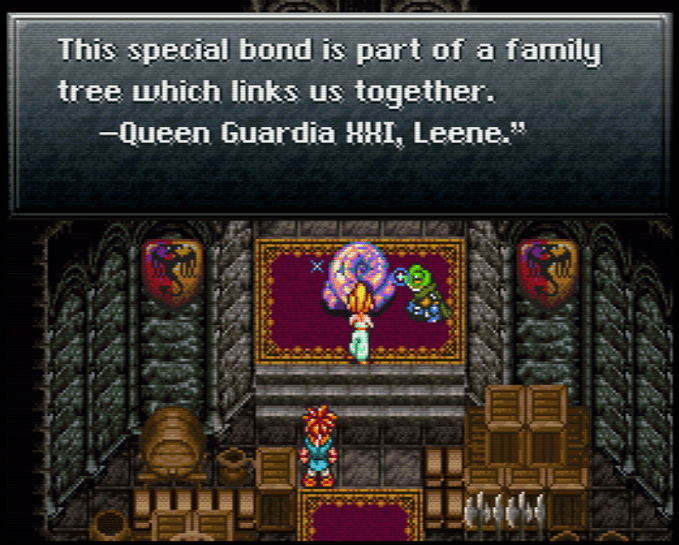 As you begin to peel back the layers of the onion, though, you’ll start to learn about the backstories of the characters, and start to understand WHY Frog cares so much about honor, and WHY Marle wants to escape her hoity-toity life, and that level of character development really helps get you invested and want to keep going. It’s not all time-travel and fairy tales, of course. 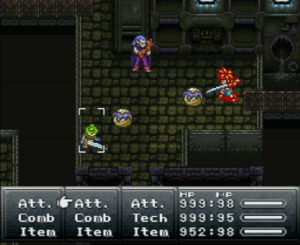 You are gonna have to put the hurt on creatures various and sundry during your quest, and Chrono Trigger delivers with its combat system. Everybody has a standard attack, as well as Techniques, which tap into your supply of Magic Points. Magic is broken into four elements, Lightning, Fire, Water, and Shadow. In a nice little piece of logic, not every character can use magic, per se; Ayla the neanderthal Amazon can’t use magic because she comes from a time before magic was discovered, and Robo can’t use it because, well, he’s a robot. Now it does pay to keep tabs on your team, because of one of the big quirks of the combat system, Double and Triple Techniques, which allow two or three characters to join powers. For example, Crono and Ayla can combine for Volt Bite, combining Crono’s Lightning and Ayla’s brute force, and Lucca, Crono, and Frog together can launch Delta Storm, combining all three of their elements for an attack that lays waste to anyone fool enough to challenge you. You’ll also find new weapons and armor, of course, as well as special accessories that modify character attributes or infuse them with certain powers. The weapons and armor do just kinda get generically better, but the accessories do have different advantages that require you to weigh their benefits before choosing one over another. Now, I know what some of you are probably thinking, “yes, Dave, the combat system better be good, because I’m gonna be spending a lot of time grinding and levelling up, right?” Wrong! Unless you’re actively going out of your way to dodge encounters with garden-variety enemies, you generally do get enough reps and experience over the course of the game to where by the time you run into bigger enemies or boss battles, you should be on equal footing with the opposition. Now, being the overly cautious type of player that I am, I did manage to find a couple of prime spots to load up on experience points with the benefit of a nearby save point (which, it should be mentioned, are rather few and far between, but for the most part, you’ll happen upon them just before something big goes down, so losing to a boss won’t set you back an hour), but, as it turned out, taking ten to fifteen minutes just for grinding got me a couple of levels higher than I probably needed to be at the time, which may have taken a bit of the drama out of some battles, but not enough to ruin them. I’m not gonna spoil it, but the payoff for this storyline was SWEET. As I said, the big bugaboo that usually turns me off of RPGs is the ability to get stuck at a point where I have no idea where to go and the game decides not to drop any hints. 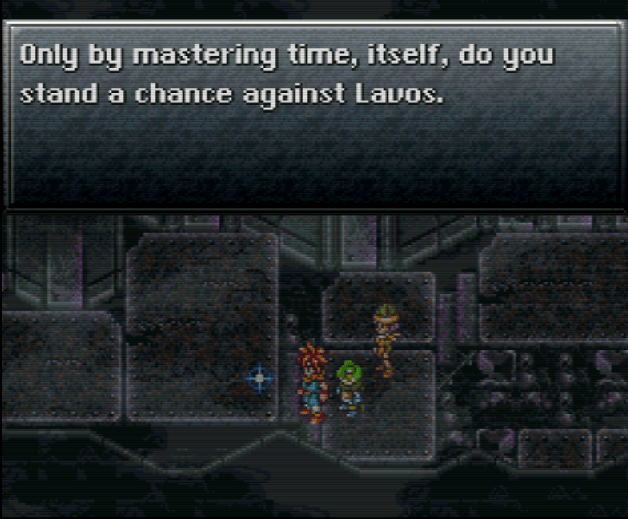 I’m thankful to report Chrono Trigger does not like to engage in such chicanery; every puzzle has a logical explanation and you can usually figure out where to go, either from hints in the dialogue or from making some Sherlock Holmes-esque deductions. For example, in the post-apocalyptic era, you’ll happen upon a factory/laboratory with a massive locked door, protected by the Zabie security system. Now, you can find the password deeper in the factory, which requires you to use the factory crane to remove two barrels blocking you from the room where the password is stored, or you can attempt to crack the password through guesswork. Y’see, the password requires a combination of the A, B, X and Y buttons. The security system is called Zabie, which actually provides a hint: Zabie is the phonetic equivalent of the answer: X-A-B-Y. So simple, yet so clever. While you’ll be crawling through your fair share of dungeons, you won’t need to draw your own maps, which is good, but I would advise you to keep Notepad handy at times, because while the game does feed you pretty much all the intel you need, it generally only shares it once, but even then, you can probably just remember most of the pertinent information yourself. I can personally attest to only one incident where I came close to tapping out and looking for outside assistance, but persistence and some critical thinking got me through it after only about an hour and a half of farting about…which is actually something of a compliment, that Chrono Trigger is so good that I was willing to go in circles for that long in order to see what happened next. 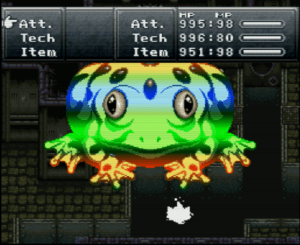 Frog uses Frog Squash, which may be the new leader for Greatest Attack in Gaming History. It’s also a bonus that the game looks and sounds great. Character sprites are decent-sized and extremely well-animated, with Frog’s hopping gait being a particular delight. Backgrounds are extremely well-rendered, and at times, there’s some skillful use of parallax scrolling and pseudo 3D effects. Candles flicker convincingly, village residences look properly snug and cozy, and the post-apocalyptic future is ensconced in a dreary blanket of fog and snow while the sad, almost minimalist theme plays in the background to really hammer home the feeling of trudging through a frozen wasteland devoid of hope. Altogether, you can tell Square was capable of going shot-for-shot with Rareware and Nintendo when it comes to creating atmosphere. 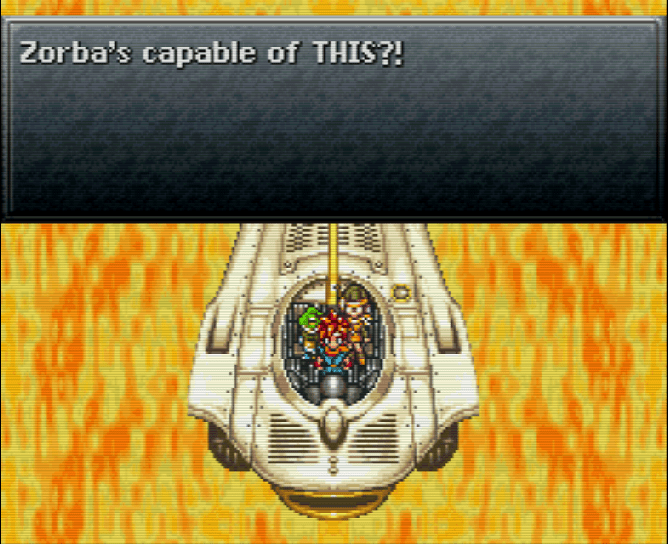 It’s surprisingly difficult for me to put into words just how much I enjoyed Chrono Trigger. It really made me feel like a kid again, in the sense that I would be at work and think to myself, “man, I can’t wait to get out of here and go home so I can fire up Chrono Trigger again”, and playing through it for the first time made me feel like someone watching Breaking Bad or The Wire for the first time; you really get the feeling you’re witnessing a masterpiece unfold before you, and you can’t wait to see where it takes you next. 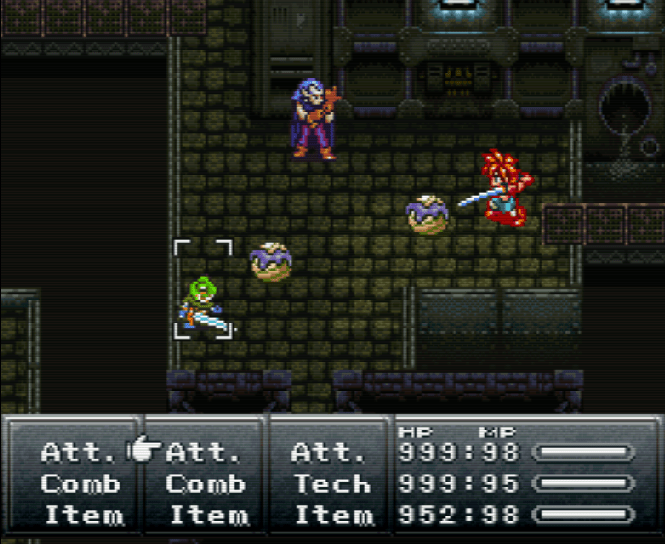 If you’ve never played this game before, even if you normally hate RPG’s, I urge, no, I implore, nope, I DEMAND you at least give Chrono Trigger a play. If you’ve played it before, I say pop it in again. If I had Men in Black technology, I’d neuralyze myself so I could play through this fresh again. It should be no surprise after all this that I’m giving Chrono Trigger the full five stars, and even THAT might be underselling it. This is one of the top five games I’ve ever played through, and I have to fight the urge to go find a review of a two-star game, borrow their unused stars, and give Chrono Trigger EIGHT stars. The reason I’m giving this game five stars is because I can’t give it eight. Enjoyable combat, pretty much 100% RPG shenanigans-free, and some of the best damn start-to-finish storytelling I’ve seen in gaming. I’m hesitant to play another Square RPG now because I don’t know how they managed to top this one. Hmm…I guess I’ll have to finish it. I started it once and never got past the first 10 minutes – not because it was boring, I just it sidetracked and never got back to it right away. Though it may seem cliche, FF7 to me has to be my favorite RPG and as I’ve played a few over the years, I’ve learned that I’m not a huge fan of the ones that are based in medieval fantasy – Chrono sounds right up my alley. What other Square games have you played through? I didn’t play it, per se, but I co-piloted a buddy playing Final Fantasy 7. That and this are literally the only Square games I’ve really bothered with. Also, congrats on 3 years! I’ve been a regular visitor since 2011 – always interesting to read in depth reviews on games I may have overlooked growing up! Chrono Trigger is 5 *****. 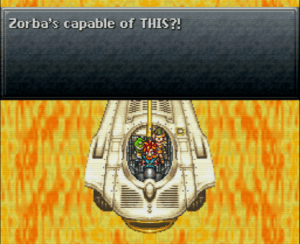 So is FF6. And Seiken Dentsu 3. Also, Final Fantasy 6 or 3 or whatever you call it will most likely be the next RPG I try to tackle. I’ve never heard of the Seiken Dentsu series, but if it gets the Kenny Seal of Approval, I will at least take a look at it. Probably ridiculously off-topic compared to the game (like it was ever gonna get less): looks like someone’s been messing around with CRT shaders, huh? Oh, one of these days, maybe, I’ll finally put this in the DS on my nightstand. Very excited to hear about no grinding necessary, though! Superhero League of Hoboken didn’t “feel like an RPG” because of that, and I loved it, so maybe that will help me get over my resistance here. Or play something like Secret of Mana for the site. Congrats and thanks for three awesome years! Recently footed the bill until 2020, I think, so we’ll keep puttering on. At least until the world turns into the dystopian future that all the NES action games said it would be. If we made it through 200X, we’ll be fine. Man, I love this; excellent stuff, dude. Brings back a TON of happy memories.